In the morning leave for Haridwar. 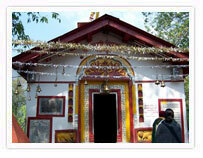 On arrival at Haridwar, Tourism Himalayas representative will greet and transfer you to hotel. Freshen up and relax. In the evening, attend Aarati ceremony at Har-Ki-Pauri – one of the most sacred ghats of India. After breakfast at the hotel, drive to Uttarkashi – situated at the bank of river Bhagirathi. On arrival at Uttarkashi, check-in at your pre-booked hotel. Freshen up and relax. In the evening visit the famous Lord Vishwanath Temple and the Shakti Temple. Other famous temples in this town are Ekadash Rudra Temple, Bhairav Temple, Gyaneshwar Temple and Goddess Kuteti Devi Temple. In the morning, drive to Gangotri. On arrival at Gangotri, take a holy dip in the sacred River Ganges, also called Bhagirathi at it origin. Perform Pooja and offer prayers. Relax for some time in the picturesque surroundings and refreshing air. In the afternoon drive back to Uttarkashi. On arrival, check-in at hotel. After hearty breakfast at the hotel, drive to Haridwar. Enjoy excursion trip to visit beautiful Tehri Lake. Have you lunch on the way. On arrival at Haridwar, check-in at your pre-booked hotel. Freshen up and relax. Have a relaxed breakfast at the hotel. Later you will be transferred to Delhi from where you will travel back to your home destination with happy memories of Uttarkashi Gangotri tour.